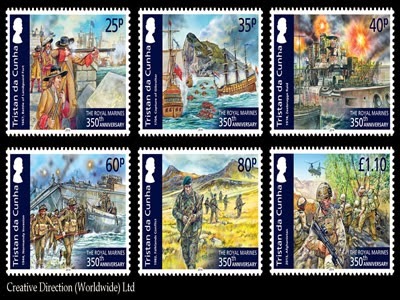 This year the Royal Marines celebrate their 350th Anniversary. From fighting on the decksand in the mastheads at the Battle of Trafalgar, through two World Wars, to the modern day leading the assaults on the Falkland Islands and Iraq and operating in Afghanistan, they are an integral part of Britain’s defence and the Royal Navy; their distinction combines excellence, versatility and unique amphibious skills. 1667, The Battle of Landguard Fort (25p). Towards the end of the Second Anglo-Dutch War a Dutch force attacked the fort, near Felixstowe, intending to clear the way for an attack on the Royal Naval anchorage at Harwich. After repeated attempts the Dutch were repelled and the planned attack on Harwich was abandoned. The garrison of Landguard were provided by the Duke of York and Albany's Maritime Regiment of Foot, raised in 1664 and one of the earliest precursors of the Royal Marines. The defence of Landguard is perhaps most noteworthy for being was their first battle honour and it is recorded as the site of the last opposed invasion or attack of England. The Capture of Gibraltar by the forces of the Grand Alliance occurred during the War of the Spanish Succession. Marines succeeded in isolating the Gibraltar Rock from mainland Spain and then defended it successfully. After the battle the garrison on Gibraltar included Marines. So numerous are the Corps’ battle honours they are simply represented by the famous Globe and the single honour ‘Gibraltar’. Described by Churchill as “the finest feat of arms in the Great War and certainly as an episode unsurpassed in the history of the Royal Navy”, this raid, designed to block the port of Zeebrugge with obsolete ships and submarines, was only partially successful at best and casualties were high. A raiding party of Marines were to land and destroy the heavy guns defending the harbour but an untimely change in the wind direction dispersed the smoke screens with tragic consequences. The bravery of those involved cannot be denied and the raid certainly provided a huge morale boost to the British people in 1918. Over 17,500 Royal Marines took part in this,their largest deployment in Corps history. They were present in strength on the beaches and in the supporting ships of the fleet with most of the landing craft being manned by Royal Marines. The Royal Marines “Yomper” became the iconic image of the Falklands Conflict and it was the Marines and the Paratroop Regiment that spearheaded the Task Force as it sought to remove the Argentine forces from the Falklands. The Royal Marines, after landing at San Carlos Bay, fought at Mount Kent, Mount Harriet and Two Sisters before ‘yomping’ into Port Stanley. In 2013 troops from 40 Commandosymbolically lowered the Royal Navy’s white ensign that had flown above their base for the last time. The Royal Marines served successive deployments in Afghanistan between 2001-2013, 40 Commando being the very first British unit to deploy to the country in 2001, securing Bagram Airfield and going on to patrol the streets of Kabul. Royal Marines have been awarded nearly 200 operational honours for acts of bravery and distinguished service in Afghanistan, including a George Cross, 7 Distinguished Service Orders and 10 awards of the Conspicuous Gallantry Cross, including 1 posthumously. “Having been here on and off since 2001, it has been really encouraging to see the tangible progress that the Afghan National Security Forces have made in their ability to legitimately and effectively provide security in the region. . . This is testament to the sacrifices and efforts made by each operational tour. We have sadly lost many outstanding marines and soldiers during this campaign and, although only a small comfort to the families of the bereaved or injured, I can honestly say that these tragic losses have not been in vain. . . Everyone who has served here has made a difference, not only in Afghanistan but also to the security of the UK by preventing Afghanistan being a haven for terrorists.”Chief of Staff for 40 Commando, Major Karl Gray.